Lahore, Apr 18 (ANI): Pakistan President Pervez Musharraf might have been pushed to the backseat after the new democratic government took over in Islamabad, but he still seems to rule over the hearts of his countrymen, particularly the women! Miss Pakistan World 2007 Mahleej Sarkari, declared in a TV programme that she loves him and wants to go out for a date with the President. 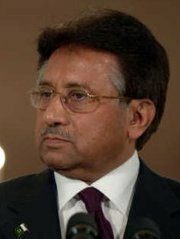 I love Musharraf, I love Musharraf, I love Musharraf, and it would be an honour and privilege for me to meet him in person and talk to him. I like the President because he has a charming personality and a charisma that attracts me towards him, the Daily Times quoted her as saying. Mahleej comes from the province of Balochistan, which according to her, was a comparatively underdeveloped province where girls are denied education and she is a witness to that.